I am a lover of sushi. Well, Japanese food in general, really. And, luckily enough for me, Sheffield has 3 restaurants that sell sushi in the city centre, and those at Meadowhall, which is great. Lots and lots of choice. Although my firm favourite is Sushi Express. It’s also, completely coincidentally (although not at all) where I went for a meal yesterday, after not dining there for over a year. Oh how I missed you, Sushi Express. It’s a bit tucked away, if you’re well versed in Sheffield nightlife, it’s quite close to DQ and Corporation, if you’re not, then it’s about five minutes past Devonshire Green. The location is actually quite nice, it takes you away from the noise of the trams, general traffic and people noise, but close enough to West Street so if you fancy a drink afterwards, you don’t have to walk very far. The staff are attentive and really accommodating, and the restaurant itself is really pretty, in a kind of minimalistic style. They refurbished when I was away in Korea, so last night was the first time for me seeing the new layout – and I have to say I was thoroughly impressed. The menu is one of the more extensive of the Japanese restaurants in Sheffield, everything from the obvious sushi, to curry, fried octopus, and bento boxes. There’s also a lunch menu that runs from 11am until 4pm for £4.50, which you can order with side-dishes for an extra £1.50. They also offer vegetarian dishes for those of you that don’t eat meat or fish. My personal favourite non-sushi dishes are the Tondon, Gyudon and the Pork Katsudon, and on the sushi side, I really enjoy the tuna maki, roast salmon maki, cucumber maki and the tuna nigiri. I also really like the taste of their roasted green tea – which is a complete steal for a whole teapot at £1/50 if you’re being selfish and not sharing. All their teas are incredibly priced actually, and range from green tea to plum wine and a couple of cocktails. Although the restaurant isn’t the biggest space in the world (certainly a lot larger than a lot of the place I’ve eaten at in Korea, though still relatively ‘average sized’ as things go in England), the atmosphere is really warm, and you don’t have any trouble conducting dinner-table conversation. Even during busier periods, the service is quick and efficient. I think one of my favourite things to do at Sushi Express is to persuade people to order the Spicy Salmon Maki. It’s probably the spiciest thing on the menu, and I gladly challenge any of you reading this to try it if you go. It’s definitely an experience. 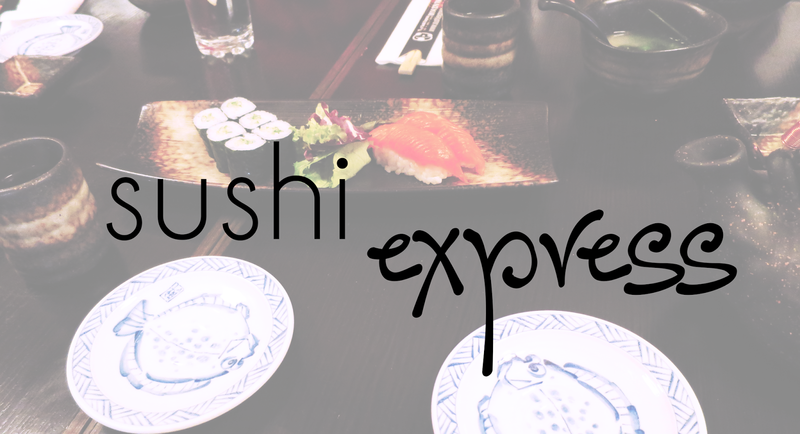 Sushi Express also serves sushi platters, but these have to be ordered in advance, to allow for preparation time of the different types of dish. They also offer a delivery service for takeout. Bonus: if you fancy a little something as a memento of your trip, Sushi Express also offers traditional Japanese hand-crafts to buy, which is quite a cute touch.